2013 and 2014 have been great years for Motorola in India, after it almost vanished from the Indian market it has regained its position up to an extent, but will Motorola be able to beat its competitors, especially Redmi 1s? Motorola has been improving a lot in terms of quality and sales in India and in India, they have been able to hold a good market with phones like Moto G, Moto E, Moto X and the latest Moto G 2nd Gen. Motorola is mainly focusing on low end and mid range handsets, which are really affordable. But the question is, while the new player in the smartphone market in India, Xiaomi is bringing up phones which has just similar features as Moto G 2nd Gen and costs much lesser than Moto G 2nd Gen, will Motorola be able to stand out and make Moto G 2nd Gen a great success like the older Moto G? Here’s a analysis of the smartphone market along with Motorola’s possibility. 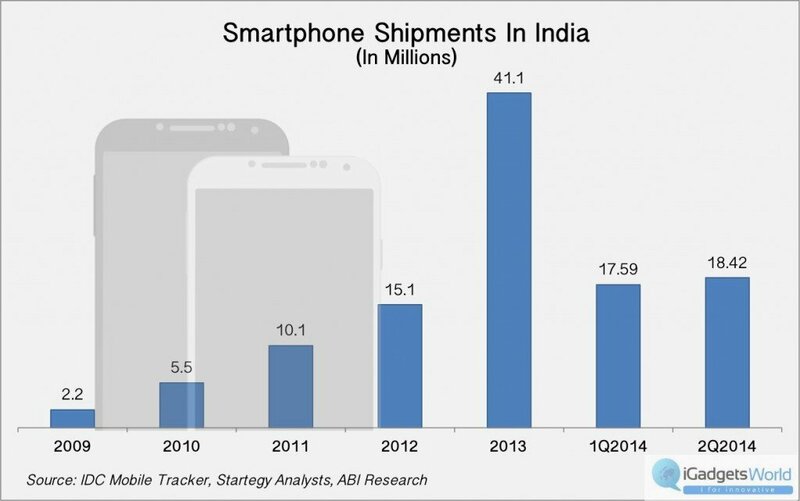 Since 2009, smartphone shipments in India has increased dramatically, if I say precisely, it is like from 2.2 million to 18.42 million. Which is a pretty huge increase. Now, among the 18.42 million shipments, Motorola sold 1.6 million handsets since it reentered the market in India, with its Moto G, Moto X and Moto E, sold exclusively via Flipkart. And among these three, Moto E has been the fastest selling Motorola handset in India. Now, with Moto G and Moto X 2nd Gen, Motorola expects that they will be able to get to the top of the market. Now here’s what the Senior Marketing Director of Motorola said. – Sr. Markeing Director, Motorola. The phenomenal growth of Motorola in India has helped the company to reclaim its grounds in the country. After the sales performance during the second quarter, Motorola has abased Nokia by replacing it in the list of Top 5 smartphone vendors in India Q2 , 2014. But, this year, the Apple of China, Xiaomi entered the smartphone market in India with an exclusive tieup with Flipkart and Xiaomi introduced Mi3 and Redmi 1s at jaw dropping prices. In 6 weeks since the launch, Xiaomi has sold nearly 135,000 units of Mi3 and Redmi 1S, combined. While Xiaomi follows the flash sale strategy and puts up few thousands of handsets every week for sale, Motorola has planned to penetrate the market by importing 140,000 units of 2nd gen Moto G, up for grab in the first round of sales. Both Motorola ad Xiaomi has been able to fulfill their expectations of grabbing a bigger share in the smartphone market in India, now the third largest smartphone and the second largest mobile phone market in the world. And this smartphone market is now going though unpredictable changes. While Motorola is mainly focusing on quality and extension of service centers, and now has over 125 service centers in India, Xiaomi is mainly aiming at the natural instinct of the Indian consumers to think about value for money. Even if we speak very personally, nobody is asking about how Moto G 2nd Gen is better than the older one, or why should they buy instead of Redmi 1s. Most people are actually asking us how to get a Redmi 1s, and this is just because Redmi 1s is priced much lower than Moto G, but packed with lots of features. And till now, Redmi 1s is making more buzz than Moto G 2nd Gen, just the old Moto G users are interested in what the new Moto G has or what it can do, or else, till now, we are getting more and more queries about Redmi 1s. Now, many things have changed in the market and people don’t care about brand value in India, like earlier they used to do. Not only the Redmi 1s, the newly launched Canvas Nitro can also give Mot G 2nd Gen a tough competition. In case of specs, except the processor, which is a MediaTek processor, Canvas Nitro seems to be ahead of Moto G, but people are not still considering Micromax as an alternative to Moto G 2nd Gen. Instead, the first choice is being made in favor of Redmi 1s and then Motorola. So, it may be pretty tough for Motorola to take Moto G 2nd Gen sales ahead of Redmi 1s. We also compared between Moto G 2nd and Micromax Canvas Nitro. And while Canvas Nitro seems to be ahead in case of Specs, Moto G is ahead in case of brand value and of course, the build quality. We can now just assume that Redmi 1s may be ahead of Moto G 2nd Gen if they continue the sales and don’t discontinue like Mi3, when they launch another newer Xiaomi phone. You can also read our previous comparisons from the list below.